On December 19, a freak snow shower coated the dusty red dunes of Aïn Séfra, Algeria’s ‘Gateway to the Desert’. The rare snowfall generated excitement after local photographer Karim Bouchetata posted several stunning pictures of rolling dunes covered in white on his Facebook page. In 1984, charitable supergroup Band Aid sang, ‘And there won’t be snow in Africa this Christmas time’. Had it been this year, they’d have got it wrong — on December 19, a freak snow shower coated the dusty red dunes of Aïn Séfra, Algeria’s ‘Gateway to the Desert’. The snow — the result of a combination of atmospheric factors — stayed for about a day before melting. 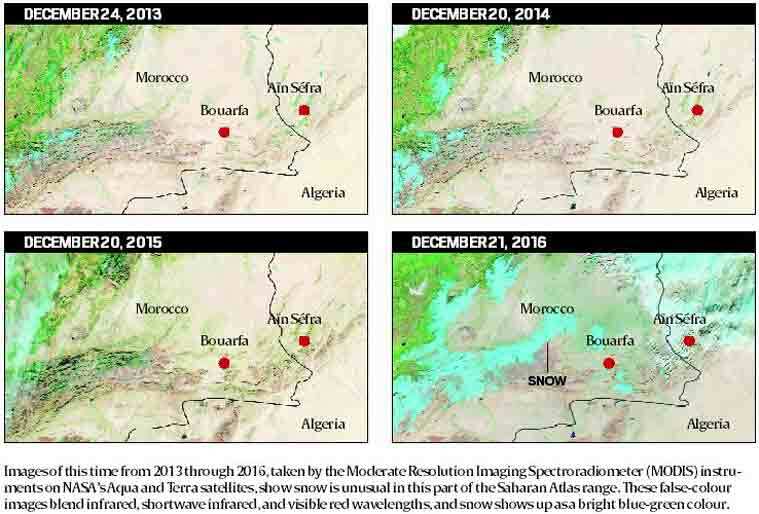 The Washington Post reported that a weather map analysis from the day of the snowfall shows that temperatures in the area, at the foothills of the Atlas Mountains, were about 10 to 15 degrees colder than normal when the event occurred. Also, a very strong patch of low pressure had been created at a high altitude, which rapidly sucked up air and cooled it, creating conditions for the extremely rare snowfall. Aïn Séfra, which is situated between the Atlas Mountains and the northern fringes of the Sahara, saw a half-hour snowstorm earlier in February 1979. This region receives only a few centimetres of precipitation every year. In July 2011, the world’s driest desert, the Atacama in Chile, received 80 cm of snow. This week’s event could be another sign of climate change.